Valley Implement has your new or used pull type Supreme Mixer Wagon! 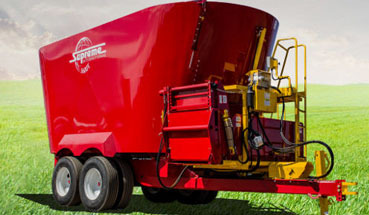 A Supreme TMR Mixer (Total Mix Ration) feed wagon with twin augers will make feeding your animals a breeze. We offer 500T, 600T, 700T, 800T, 900T, 1000T, 1200T, 1400T and 1600T models. The 500T Pull Type Mixer Wagon has 2 patented freestanding vertical cutting augers, 2 heavy-duty, 2 stage planetary drives and 8 replaceable forage cutting blades. Learn more. This Mixer Wagon has 2 patented freestanding vertical cutting augers, two heavy-duty, two-stage planetary drives and 10 replaceable forage cutting blades. Learn more. 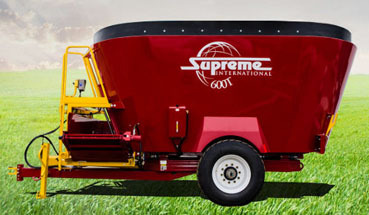 Supreme's 1600T Pull Type Mixer offers twin screw mixers, 2 two-stage planetary drives and 10 replaceable forage cutting blades. Learn more.